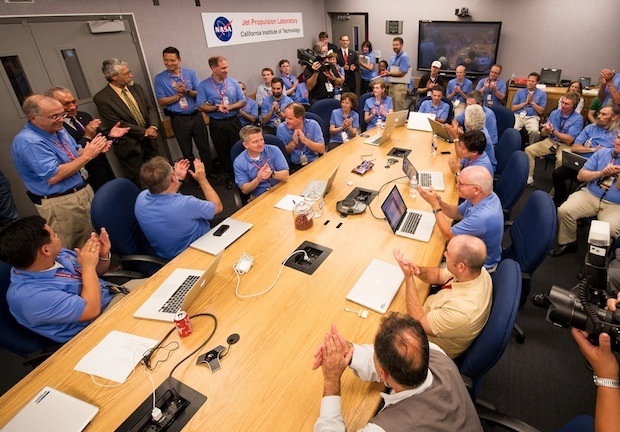 Any Mac fan watching the Mars Curiosity landing last night probably noticed the abundance of glowing Apple logos on the desks of NASA engineers and scientists. Exactly how all the Macs participated in managing Curiosity from millions of miles away is unknown, but the overwhelming presence of MacBook Pro’s should tell you they played an important enough role to make any Apple fan proud. Sure, there were PC’s in there too, but who cares? Watching the awe-inspiring event was like a live Mac Setups post on steroids. Every once in a while you’d get a glimpse of a MacBook Pro screen and you could see an array of familiar icons in the Dock including Xcode, Preview, Chrome, Firefox, Aperture, Parallels, and more. Personally, I’m just amazed anyone can actually type on the iPad. LOL. It’s like anything, just takes practice. I have no problem from day one. I guess since I have to use a lot of LCD touch screens it just comes naturally. I have 8 fingers on ipad. No need an ext keyboard. I love my ipad. As I understand from a friend who works as a contractor for NASA, at least with the engineers, each is given a choice for their computer, Windows, Mac, or Linux. The IT department supports standards for all these OSs. Not sure which Linux they use. I wish all companies would be that flexible. Sure it might make hiring IT people harder but the employes are happy. This story would be even more impressive if the fanboy who wrote it would have said “the overwhelming presence of MacBook Pro’s should tell you they played an important enough ROLE to make any Apple fan proud” instead of “the overwhelming presence of MacBook Pro’s should tell you they played an important enough roll to make any Apple fan proud” which shows that Apple fans can’t even SPELL!! So someone who you don’t know – and therefore don’t know whether or not they’re a “fanboy” – makes one silly spelling mistake and that means all Apple fans can’t spell?!? And I pity them for many reasons. Who needs proof reading when commenters provide a free spell check service? The words, petty, small minded, and pathetic, come to mind when reading your post. Thats what the world expects from people who can’t appreciate the better things in life. Enjoy your crappy PC experience. You obviously deserve it. Ha ha, all gathering for the fruity circle jerk, all for a moronic spelling mistake. Your comment would have been more impressive as well if you didn’t repeat the mistake of trying to pluralize an awkward looking word by adding ” ‘s ” to the end of it. 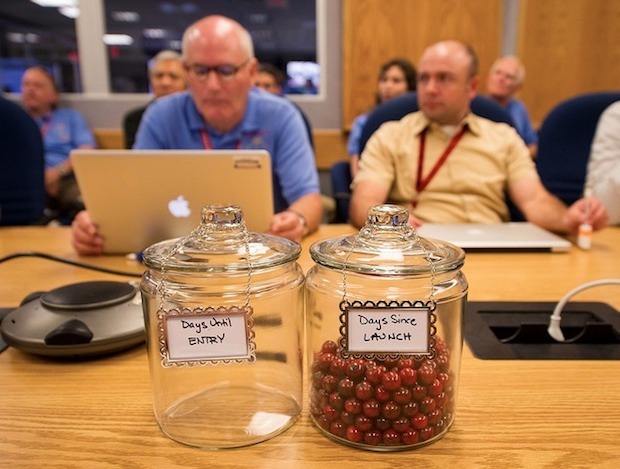 The Macs were there for the window dressing but the real work was done by Dell and VxWorks. good read. wonder why its being ignored? 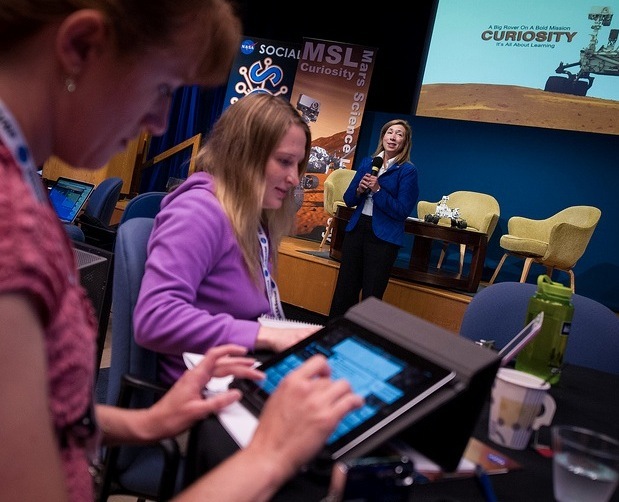 Seems to me the iPads were not used by any of the NASA scientists. It looks like they might be reporters or bloggers taking notes at the press conference. It’s not that many years ago that in the face of huge internal dissent, NASA decreed a ‘PC only’ policy. Nice to see that they have seen sense. NASA, or any tax payer funded agency for that matter, has never been known for its judicious use of money. Hell yes my assistant needs a thunderbolt display… these spreadsheets aren’t going to fill themselves in! At my company (15k+ employees) they allowed us to choose between a macbook pro/air or a PC. After 6 months the mac usage has exploded to grip a majority at our company. Which in turn has led to requirements that all software should be available on the mac as well. So all our inhouse software is now mainly developed for the Mac, and secondary for the PC. I am thinking that this is the future, and the NASA guys really show us it is. When W8 hits the streets I think even more people will realize the glorious advantages of owning a close to perfect system. Ha ha, what a pathetic person. Um, all kinds of wrong. The viewing experience was mainly on Mac, but that is not the OS or the format for programming. 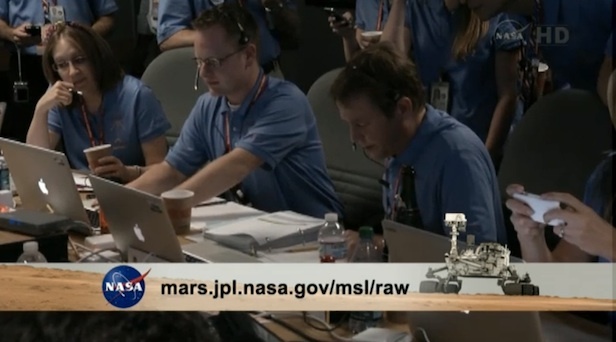 NASA uses a mix including an OS that was specifically designed for them. 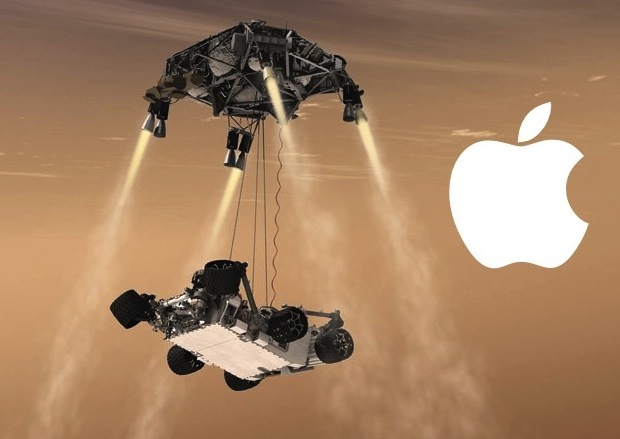 I can say with certainty that Mac is not the official OS of NASA. Mac is great if you want to plug in a scanner but if you think that same intuitiveness launches rockets into space you are out of your mind. P.S. the greatest hackers in the world use PC. Wanna know why? Because PC is endlessly customizable. Mac does everything for you, for sure. But if you know your way around an OS or actually know how to use a computer (I’m talking HARDWARE here, not software) than PC is the way to go. I saw not just an iPad there but also a 12″ PowerBook G4! Look closely at the laptops. Most are the unibody MBPs with the black keyboard but one of them is a 4:3 sized laptop with a silver keyboard. Thats the baby PBG4! Nice to see one still kicking around in a mission critical situation.